An ad for Something Rotten! Somthing Rotten! soldiers on at the St. James with its scrappy fairytale of the genesis of musical theater eight times a week. The idolized charismatic Shakespeare and his rivals the unsung Bottom brothers (they do sing, it’s a musical) are its center and its firmament. 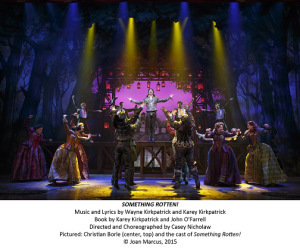 Catch up with Something Rotten!, again or for the first time now. It’s musical theatre history in the making. For our review, click here. Brian d’Arcy James is having the time of his life. 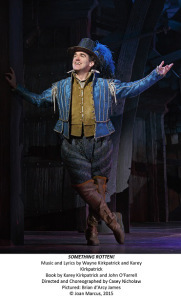 In the context of Something Rotten!, at the St. James Theatre for what is destined to be a very long run, his jubiliation seems unwarranted. Nick Bottom, the character James so winniningly inhabits, is a failed playwright, who has lost the patronage of Lord Clapham (Peter Bartlett.) Nick’s deep envy of Will Shakespeare’s (Christian Borle) meteoric success gnaws at him. To help with the family finances, Nick’s wife Bea (Heidi Blickenstaff) disguises herself as a boy in order to work at menial labor. She says woman should be allowed to work; “it’s the ’90s, soon it will be 1600; there’s a woman on the throne….” Nick’s writing partner is his brother, Nigel (John Criani), a talented young man who admires Shakespeare.